It's the age-old question we ask ourselves when we sit down with a new (beginning) student for the first time. What should we talk about first? Hand position? Finger numbers? Letter names? Where's Middle C? I like to get the student playing as quickly as possible. We explore high sounds and low sounds and sounds in the middle, black keys and white keys and the patterns they make, and rhythm patterns based on our heartbeat. We imitate, improvise, and create. The first lesson is all about experimenting with the instrument and exploring sound. Practice forming the hand into a relaxed "C" shape in the air, pointing out the curved fingers, flat wrist, and knuckles showing. Place "piano hand" on keyboard. Look for groups of two black keys. With right hand fingers 2 and 3, block all the groups of two black keys going UP the keyboard. Then, with left hand fingers 2 and 3, block them going DOWN the keyboard (or start in the middle and have right hand play the HIGH side and left hand play the LOW side). Repeat with groups of three black keys. Check the student's understanding of this terminology (up/down, high/low) by quizzing them: "Play a group of three black keys HIGH on the keyboard." "Play groups of two black keys LOW on the keyboard, going UP." Create an improvisation using any of the black keys and teacher accompaniment. (Optional) Find a group of two black keys in the middle of the piano. Move your hand to the white keys. Using fingers 2, 3, and 4, block these three white keys, saying their letter names: "C-D-E." Can you find another group of C-D-E? Repeat with the group of three black keys/four white keys, saying: "F-G-A-B." Introduce quarter and half notes with rhythm pattern cards. Step the steady beat together, counting: "1-1-1-1." Switch to stepping the half note beat, counting: "1-2, 1-2." Repeat, as needed, until the student is counting and stepping on their own. Go back to the piano and introduce the first two pieces. 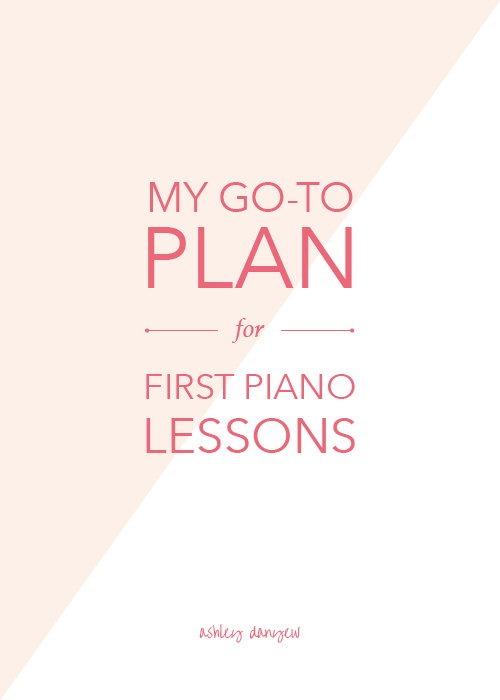 (In most beginning method books, the first two pieces go together and often focus on playing a repeated rhythm pattern on the black keys up and down the keyboard). This is their home assignment. Encourage creativity by asking them to compose their own piece using groups of two or three black keys and quarter notes and half notes. For a few more ideas, see Rethinking the Student's First Lesson by Joy Morin. What do you do in first lessons? Share your lesson plan ideas below!